The idea of brain enhancement may sound a little like something from the pages of Frankenstein, but as science advances, it may become as common as cosmetic surgery. 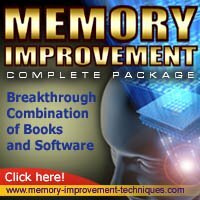 Whether you are suffering a failing memory due to advancing years or need a mental edge to help you in your career, several methods of brain development are now available. The practice of lobotomy, as seen in the film One Flew Over the Cuckoo's Nest, has long been out of favor. Yet our increasing understanding of brain geography and function are making it possible to remove or disconnect structures in the brain that may be dysfunctional or damaged. A brain tumor may be one cause of diminished brain function that has been easily treated by surgery for many years. Experiments are also being carried out into stimulating the brain tissues by use of electrodes or trans-cranial magnetic stimulation to improve brain function. Another means of brain enhancement through drugs ranging from caffeine - the active stimulant in coffee and cola - to amphetamines. These cognitive enhancers improve mental agility, memory, attention, and concentration, and can be said to increase intelligence. They work by changing the neurochemicals available to the brain and improving the blood supply to the brain. Herbal supplements have also been taken been used by people who believe they can improve brain function, though the claims made for many of these are unproven. Ginkgo biloba is known to improve brain function and memory by increasing blood circulation to the brain. Certain vitamins have also been found to help in retarding the aging processes in the brain, which cause memory failure. Any brain enhancement program should start with maintaining the health of the body, taking plenty of exercise, eating a balanced diet and having sufficient sleep. Sleep deprived people have been shown to be slower at learning than those who have had enough sleep, and the learning ability peaks after sleep. A regime of mental exercise will also do wonders for the functioning of the brain, which, like any part of the body, tends to get lazy and inefficient if it is not used properly. Brain fitness will certainly be achieved by exercising the brain with puzzles, quizzes, reading, and work. See information on memory loss here. The brain's ability to learn can be developed, even in later life, with simple activities like learning a poem by heart. If any of these activities are carried out on a regular basis improvements in memory and cognitive function will be seen.